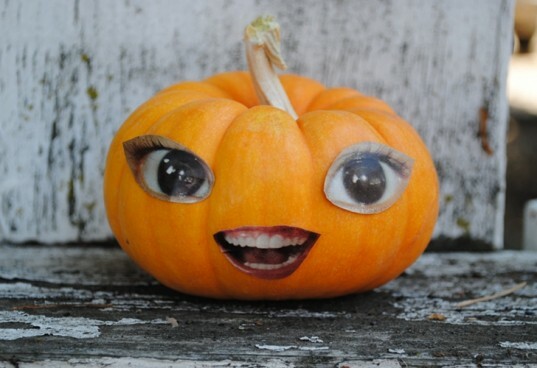 Looking for a fresh, unique way to decorate your pumpkin this Halloween season? Here we highlight 5 ways to create a pumpkin that sits pretty, and there's no carving involved! According to the Journal of Pediatrics, Halloween is responsible for producing more ER visits than any other holiday, due to finger and hand injuries. That's why we say put down the knives and carving tools and opt for these fabulous pumpkins instead! Neon is back in style, so why not be on trend with a neon pumpkin? First, you will want to paint your pumpkin white. 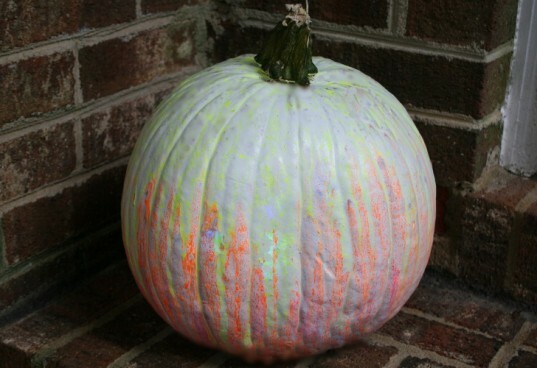 If you want a streak look like the pumpkin above, spray slightly watered down non-toxic neon paint onto the pumpkin. If you want it to be brighter and more vibrantly hued, allow the white paint to dry. 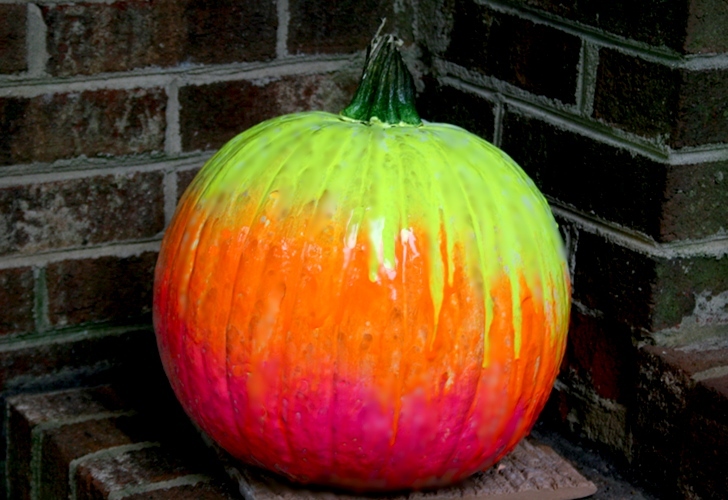 Then spray the neon paint onto the pumpkin. You can also use regular paint and a wet cotton ball to blend the colors. 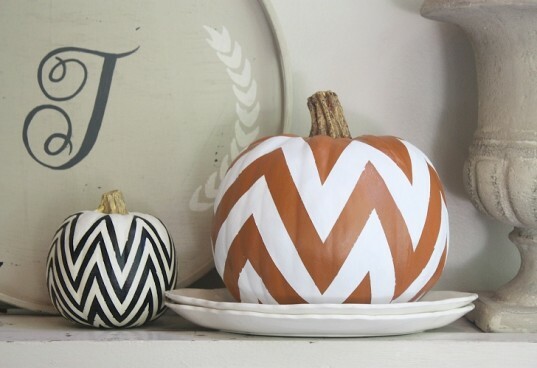 Melaine from My Sweet Savannah made these super cute chevron pumpkins by using painters tape. She cut up strips of tape and placed them on the pumpkin to create the chevron pattern. Then she painted the entire pumpkin, covering the tape. After the paint dried, she pulled off the tape. Follow her step by step instructions here. Jessica from Zakka Life cut out mouths, eyes, and other objects from magazines and glued them to pumpkins to make silly faces. You can also make scary faces, animal faces, animated faces, and more! See more of Jessica’s ideas on her blog here. Melissa from Lulu the Baker crafted this complex argyle pumpkin. 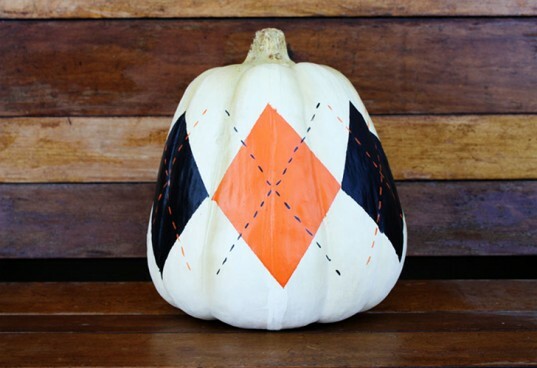 First she painted the pumpkin white — then she used painters tape to make the diamond shapes. Next she painted in the diamonds in alternating colors. Finally, Melissa used a fine tipped paint brush and made dotted X’s over the diamonds. Follow her step by step instructions here. This chalkboard pumpkin is super easy to make and so creative! Jessica from Zakka Life covered the stem of the pumpkin with painters tape and used three coats of chalkboard paint to cover the pumpkin. 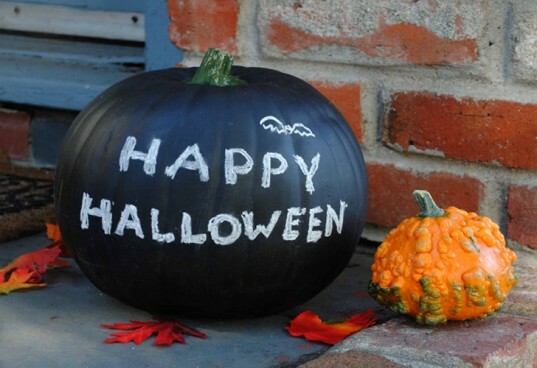 She let the pumpkin dry for 24 hours before she wrote her festive greeting on it with chalk. Read more here. These are great thanks for the ideas! Jessica from Zakka Life cut out mouths, eyes, and other objects from magazines and glued them to pumpkins to make silly faces. You can make scary faces, animal faces, animated faces, and more! See more of Jessica's ideas on her blog here. Melissa from Lulu the Baker crafted this complex argyle pumpkin. First she painted the pumpkin white -- then she used painters tape to make the diamond shapes. Next she painted in the diamonds in alternating colors. Finally, Melissa used a fine tipped paint brush and made dotted X's over the diamonds. Follow her step by step instructions here.